F-69364, LYON, cedex 07, France. 2Philibert Savours company, ZA La Fontaine, 01290 Crottet, France. 3University Lyon, Lyon 1 University, ISARA Lyon, BioDyMIA (Bioengineering and Food Microbial Dynamics Interfaces), EA n°3733, IUT Lyon 1, technopole Alimentec, rue Henri de Boissieu, F-01000, BOURG-EN-BRESSE, France. 4 ISARA Lyon, Chemistry laboratory, 23 Rue Jean Baldassini, 69364 Lyon, France. Consumer demand for healthy foods has been increasing for a few decades. In the formulations of their low-fat products, most food manufacturers use artificial aroma and texturing agents. However, the additives used are often judged negatively by consumers. Fermented ingredients with aromatic and textural attributes could provide a good alternative to additives. In this study, the effect of fermented dairy ingredients on low-fat brioches is studied at two levels via sensory and instrumental analyses. Keywords: Exopolysaccharides, Leuconostoc mesenteroïdes, lactic acid bacteria, rheology. Nowadays, low-fat products are of great nutritional interest to consumers, and thus for the food industries. But alongside the concern to reduce fat intake, fat also plays a crucial role in our sensory perception of foodstuffs, namely through their aromatic and textural characteristics. The challenge for the food industry is how to reduce the fat content without diminishing the palatability of the product. Although artificial aromas and texturing agents have been used for a long time with good results, these compounds are considered as additives and may therefore be judged negatively by consumers. The challenge in the field of low-fat products is to develop natural compounds exhibiting the same sensory characteristics as those of “standard” products – i.e. containing butter or vegetable fat. Wine, bread, yoghurt, cream, etc., are known to exude a pleasant aroma – such as ethanol, acetaldehyde, acetoin, diacetyl, acetate – and/or specific rheological features after fermentation1. Therefore, it could be interesting to extend the current application of fermentative microbes so as to be used as aromatic and textural ingredients, in particular to offset the reduction of fat and the implication thereof on the food product’s sensory qualities. Previously, Gemelas (2016)2 attempted to enhance the buttery aroma of white sandwich breads by employing a fermented mixture. But microbes can also contribute effectively to other sensory parameters, texture for instance. Polysaccharides are often used as hydrocolloids by food manufacturers because of their emulsifying, thickening, and binding properties3-4. Many bacterial species – and among them many Leuconostoc, a lactic acid bacterium – can produce hydrocolloid exopolysaccharides (EPS). These substances protect cells against phage contaminations and hydric stress. Concerning Leuconostoc, EPS are produced by inducible extra-cellular enzymes. Sucrose is the substrate of glucansucrase or fructansucrase, two enzymes respectively responsible for the synthesis of glucan and fructan5-6). Dxtran is a glucan molecule found in sourdough breads known, in particular, to extend the shelf-life of baked goods7. Hydrocolloids also play a second role: they participate in the trapping of aroma compounds within the food matrix. This aptitude can be very useful in baking technology, breads being exposed to flavour loss during cooking8. One postulate of our previous study highlighted this point: the diacetyl, a key component of the buttery aroma obtained from the fermentation of citrate by a Lactococcus strain was added to the dough used to make white sandwich breads. These breads were submitted to a sensory analysis. No buttery aroma was detected by the jury. Following this observation, we proposed to use a microbial culture producing both diacetyl and EPS in order to entrap the diacetyl inside the EPS net. In this article, we present the results obtained on low-fat brioches prepared with bacterial cultures producing diacetyl, EPS or a mixture of these two compounds. Thus, the aim of the study was to develop a bacterial culture which could be used to substitute a part of the butter contained in a brioche without affecting its sensory characteristics. Instrumental and sensory analyses of textural and aromatic characteristics were carried out on these low-fat brioches. The correlation between sensory and instrumental results is also discussed. One Lactococcus lactis subsp. lactis biovar. diacetylactis strain – designated hereafter as F2.3 – and one Leuconostoc mesenteroïdes strain – named P35 – were used. The F2.3 strain was a diacetyl producing biovariant isolated from a goat whey (Loire, France). The P35 strain which was able to produce significant quantities of EPS was isolated from a raw milk goat cheese (Ardèche, France). These two wild strains were phenotypically characterized and identified by 16S rRNA gene sequence analysis. The growth parameters of these two strains were the same in co- and mono-culture. The strains were kept frozen at -80°C in a mixture of culture medium (M17 broth, Biokar, Beauvais, France) and 30% glycerol (Sigma-Aldrich, St-Quentin Fallavier, France). The basic culture medium was a reconstituted whey solution (10%, w/v, Eurosérum, St Martin Belle Roche, France), prepared and aliquoted in 1L flasks, but only 500mL of broth was added to each flask). By filling the flasks to only half their capacity, we sought to optimize to optimize the surface-on-volume ratio, and thus to maximize the oxygenation rate thereafter. This solution was sterilized at 110°C for 10 min. Three flasks were seeded either with one of the two strains presented above or with a mix of the two bacteria. The initial levels were standardized at 6 log(cfu).mL-1 for each strain (in mono- and co-culture) in order to obtain respectively an aromatic (dairy.diacetyl), a textured (dairy.EPS) or an aromatic and textured (dairy.EPS+diacetyl) fermented mixture (Figure 1). Legend: pH – – , temperature (°C) …. , level of Lactococcus (log(cfu)/mL) -, Apparent viscosity (EPS) – . – and diacetyl evaluation —. Pre-fermentations were performed aerobically during 16 h at 25°C by vigorously shaking the whey solutions with a bar magnet rotating at 1.100 rpm (magnetic agitator IKA RCT basic, Staufen, Germany). 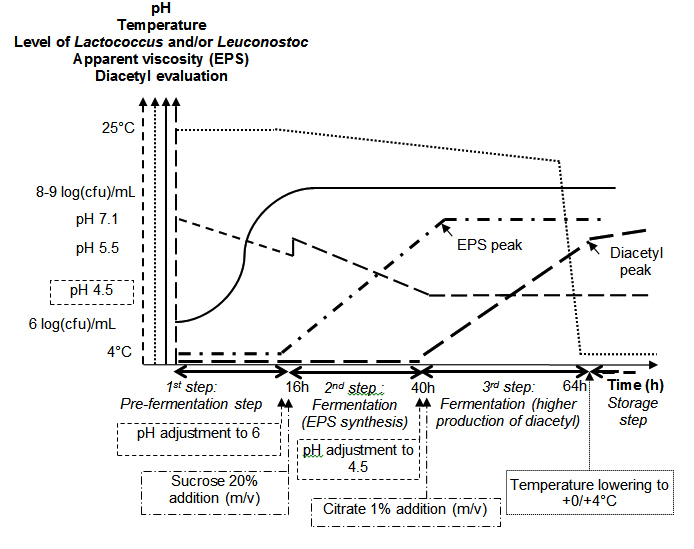 In the presence of the Lactococcus and Leuconostoc strains (co-culture), the pre-fermentation step was followed by a second fermentation step to favour EPS production: a sucrose solution (20% w/v, Sigma-Aldrich, St-Quentin Fallavier, France) was added to the pre-fermented whey solution; the pH was then adjusted at 6.6 (PHM210 standard, MeterLab®, Villeurbanne, France). The homogenization was performed less vigourously than in the previous step: 100 rpm during 24 h at 20°C. This second step of fermentation was followed by a third step involving diacetyl production: the pH was adjusted to 4.5 and anhydrous trisodium citrate (1%, w/v, Quimdis, Levallois-Perret, France) was added to the mixture. The medium was again homogenized at 100 rpm during 24 h at 20°C. During the second and the third steps, it was assumed that large amounts of both EPS and buttery aroma compounds (among them diacetyl) were produced. The mixture obtained will be referred to as “dairy.EPS+diacetyl”. For the monoculture of leuconostoc, only the second step of fermentation in presence of sucrose was run in order to produce the dairy.EPS culture. The production and characterization of the “dairy.diacetyl” by a monoculture of Lactococcus F2.3 were exposed previously2. At the end of the fermentation process, these three fermented products were quickly cooled at 4°C in frozen water. Half of the volume of each flask was used for the extraction of volatile components and rheological characterization. The rest was then used in the preparation of brioches. The three fermentations were made in triplicate. Extractions and quantifications of diacetyl were performed in the dairy fermented products – dairy.diacetyl and dairy.EPS+diacetyl – containing the strain producing the diactetyl – F2.3 strain – following the protocol detailed in previous work2. Viscosities were measured at the end of the fermentation process at 25°C with a rotary rheometer Rheomat RM180 (Mettler Toledo, Viroflay, France) with a Couette geometry with a rotating cylinder. The module of co-axial cylinders used was the MS-DIN 11. A single measurement was performed on the fermented medium containing EPS. By imposing a shear rate (D), the shear stress (τ) was measured. This latter is based on the torque required to rotate the rotor immersed in the fermented media. Thus, the shear stress was measured in the range of the torque rheometer: from 0.25 to 7.5 mN.m. The rheograms were plotted on the shear rate range from 6.46 to 129 s–1. Only the trials performed during the first charge-discharge cycle were taken into account in order to avoid the bias due to the phenomena known as hysteresis. The apparent viscosity measurement was recorded during the first-cycle charge on the rising viscosity curve at a shear rate of 10 s-1. The rheograms obtained with the fermented products were compared to a reference dextran: dextran of 2.3 .106 Da (Sigma-Aldrich, St-Quentin Fallavier, France) solubilized in water (20% p/v). This dextran produced by Ln. mesenteroïdes B-512 is known to be a linear backbone carbon containing 95% of α-(1→6) glucosidic linkages ramified on α-(1→3) glucosidic linkages by three or more units of glucose. Two recipes were followed to make the brioches (Table 1). The control brioche, referred to hereafter as “brioche.Ctrl”, corresponded to the full-butter product (20% w/w). In the test brioches, a part of the butter (6% w/w) was replaced by an equivalent quantity of one of the three fermented cultures: dairy.diacetyl, dairy.EPS or dairy.EPS+diacetyl. An equivalent quantity of water was removed in order to maintain the same consistency of the paste during the whole manufacturing process. The products obtained were subsequently named brioche.diacetyl (when dairy.diacetyl replaced the part of butter), brioche.EPS and brioche.EPS+diacetyl following the fermented product used to replace the part of butter, respectively dairy.diacetyl, dairy.EPS and dairy.EPS+diacetyl. The ingredients were mixed and kneaded (SPI 11, VMI Vendée Mécanique Industrie, Montaigu, France) during 22 min at 80 rpm. The final dough temperature was close to 25±1°C. The dough was left to rest in bulk for 20 min, then divided into 400 g pieces which were put into aluminum pans (base dimension: 265 x 85 x h 80 mm). The pans were placed in a proofer (BFA, Bongard, Strasbourg, France) for 380 min. The proofer was set at 26±1°C and 75% relative humidity. The brioches were baked at 180°C for 40 min in a convection oven (APV, Pavailler, Portes-lès-Valence, France). The core temperature of the brioches was 105°C at the end of the cooking time (digital probe thermometer Kat. Nr. 30.1018, TFA, Düsseldorf, Germany). The brioches were cooled in their pan for 120 min at room temperature. Individual brioches were stored in their pan at 25°C for one to three days in order to increase the staling phenomenon. One hour before the sensory and instrumental analyses, the brioches were cut with a bread slicer (Industrade, Strasbourg, France) into slices of 9 mm thickness. Standard baking tests were then conducted. For each recipe, nine brioches were used to determine the specific volume (mL/g). This parameter was derived from the weight measure (Viper SW6, Mettler Toledo) and from the volume of the brioche evaluated by rapeseed displacement9. The mean and standard deviations were calculated on the nine values. Fracturability (expressed in N) is the force measured before the first sudden drop corresponding to the first fracture in the sample. Legend: A = surfaces, D = peak forces, ∆t = time of actual penetration phase during the second compression11. The dimensions of slices were the following: width: 85 mm, length: between 80 to 90 mm, thickness: 18 mm. TPA was performed using a universal texturometer TA500 (Lloyd Instruments, Elancourt, France) equipped with a 50 N load cell and a 25 mm Perspex® (methyl polymthacrylate) cylindrical probe. 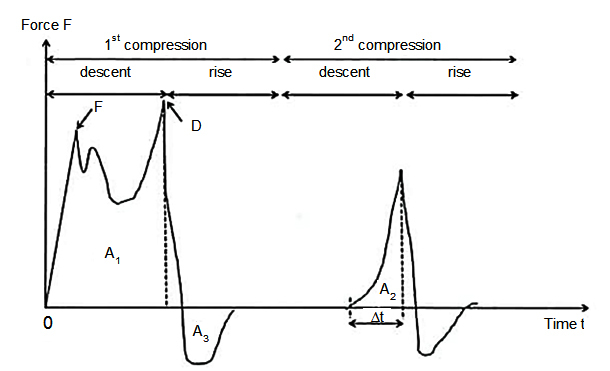 The measurement cycles included two successive uniaxial compressions. The test speed used to take the measurements was fixed at 1.0 mm/s; the center of the brioche slice was compressed to 70% of its original height. Measurements were performed in duplicate on three brioches made with the same dough preparation. The six measurements collected were used to calculate the mean and the standard deviation for each TPA parameter. Brioche moisture was determined using a dessicator, the Halogen Moisture Analyser HR73 (Mettler Toledo, Viroflay, France). One slice taken from the center of each brioche was finely chopped (Babycook Beaba®). The brioche moisture was measured on 5 g of the blend obtained. The drying temperature and the stabilization time were set at 103°C and 10 min respectively. Three measurements were performed in order to calculate the mean and the standard deviation. The different sensory analysis tests carried out during the course of this research are shown in Table 2. Panelists were different for each sessions. In the ranking test session, the panelists were requested to test the four products and to rank them according to buttery aroma intensity from the lowest to the highest. A randomized complete block procedure was then applied using the Friedman test12. In the triangular test session, the panelists were asked to taste three samples, two of which were made following the same recipe while a third sample was different. The judges had to identify which sample differed from the other two. And in this test they were forced to choose (forced-choice method). Panellists were also requested to give their opinion as comments if any on the taste, the smell, the texture and the overall appreciation. Samples were presented in a random order. Two brioches were considered significantly different (p<5%) if a correct answer was obtained for more than fifteen judges according to the binomial distribution (n, 1/3), n being the group size, 30 in our case13. In the acceptability test, a sequential monadic procedure was used: two products were tested successively and independently of each other14. The order of presentation was randomized. Panelists were requested to give their opinion on the taste, the smell, the texture and the overall appreciation. The scale proposed for possible responses were as follows: dislike very much, dislike slightly, like slightly, like very much. The preference data proportions were analyzed using a χ² test according to the Marascuilo procedure. Standard-errors were calculated with the Student number – SE = t(n-1)ddl .√ (s²/n-1) – with m the mean, s² the variance and n the number of sample – for a 5% threshold value for a (n − 1) degree of freedom. Two results were considered as significantly different (p<5%) if their mean ± the standard-error did not overlap. The apparent viscosity of the dairy.EPS and dairy.EPS+diacetyl samples was identical: 3.60±0.84 Pa.s at a shear rate of 10 s-1. These fermented products were considered as time-dependent non-Newtonian fluids and characterized by a shear-thickening behaviour (i.e. pseudoplastic behaviour). According to Mironescu (2003)15, the rheological behaviour of the exopolysaccharides in solution depends on the type of bacteria used (genus and species) and on the physico-chemical characteristics of the culture medium (temperature, pH, inorganic salts, etc.). Indeed, a pseudoplastic behaviour had already been noticed with dextrans synthetized by strains of Leuconostoc or other microorganisms such as Paenibacillus and Bacillus16. At the molecular scale, this rheological behaviour results from the entanglement of the long linear backbone chains17. On the contrary, the reference dextran used during the course of our work was characterized by a Newtonian behavior with an apparent viscosity level twenty times lower than the apparent viscosity observed in the dairy.EPS and dairy.EPS+diacetyl fermented products. The ability of EPS to increase viscosity depends on molecular parameters such as high molar mass and radius gyration18. For a given molecular mass, the linear EPS exhibits a higher viscosity than its ramified homologous. The reference dextran produced by Ln. mesenteroïdes B-512 is known to be a linear backbone carbon containing 95% of α-(1→6) glucosidic linkages with a molecular mass of 2.3.106 Da. Therefore, the EPS produced by the environmental strain should have a molecular mass superior to 2.3.106 Da and/or a linear molecular structure. Diacetyl was extracted from the two fermented mixtures: dairy.diacetyl and dairy.EPS+diacetyl. But it was only identified by GC-FID in the dairy.diacetyl and not in the presence of EPS in the dairy.EPS+diacetyl. Hydrocolloids are known for their ability to retain volatile molecules, a characteristic used in diverse processes of encapsulation8,19. As such, the retention of volatile aroma compounds inside the food matrix appears to offer an interesting possibility during the baking process, especially during the cooking step. Results depend on the type of aroma compound – molecular weight, polarity, chemical group and relative volatility – and hydrocolloid employed – molecular weight, spatial conformation and chemical group20. Our failure to extract diacetyl from dairy.EPS.diacetyl sample by a liquid/liquid extraction procedure seemed to confirm the entrapment of the aroma compounds in the net, preventing it also from evaporation during the baking process. According to the ranking sensory test, the four brioches, brioche.Ctrl, brioche.EPS, brioche.diacetyl, brioche.EPS+diacetyl, could not be significantly distinguished in terms of their buttery intensity. In particular, the products made with aromatic cultures (brioche.EPS+diacetyl and brioche.diacteyl) were not distinguished from the other brioches. Diacetyl is a small diketone molecule, hydrophilic and volatile. The retention of this compound in the food matrix is generally weak, even in the presence of carbohydrate macromolecules such as starch, β-cyclodextrin or caseinate21. Furthermore, the aroma retention ability of hydrocolloids depends on the chemical characteristics of the macromolecules22. During the cooking step, the high temperature can cause the aroma compounds to be volatilized and/or their transformation8. Our results confirm these observations: the net formed by the EPS produced by the Leuconostoc strain did not seem to retain diacetyl during the baking process. The results of the ranking test were further confirmed by triangular tests. They led to the same conclusions: panelists were unable to separate the different brioches significantly. Thus, lowering the quantity of butter by 6% (w/w) in the brioche seemed to have no impact on the sensory characteristics. A consumer acceptability test confirmed this first observation. Indeed, the two products brioche.Ctrl and brioche.EPS were not differentiated by taste, smell, texture or overall appreciations. The aim of the study was firstly to develop a fermented product with buttery aroma and exopolysaccharides, in order to counteract the aromatic and textural alteration of the low-fat products, particularly bakery goods. We assumed that the decrease in the quantity of butter in a brioche recipe would have a deleterious effect on the sensory characteristics. Our results do not confirm this hypothesis. Indeed, the brioche control was not distinguished from the brioche containing EPS as a replacement for part of the butter. Nevertheless, these results are in accordance with a national French survey led by the “Observatoire de la Qualité de l’Alimentation”. The latter pointed out that reducing fat content in some industrial biscuits would not cause any sensory alteration23. The effect of EPS on brioche storage duration (from one to three days) was evaluated by means of instrumental and sensory analyses. The standard-errors were evaluated to ±0.17 mL/g for the specific volume, ±0.19 mm of elasticity obtained by TPA and ±0.70% of brioche moisture. Concerning the moisture rate and the specific volume, it was not possible to differentiate the brioche.Ctrl samples from the brioche.EPS samples whatever the storage duration (Table 3). Consequently, the EPS produced by the Leuconostoc strain P35 had no significant effect on the volume of the brioche. This observation had already been reported by Gómez et al. (2007)24 who noted that the effect of EPS on the specific volume depended on the kind of hydrocolloids used. The moisture rate was similar in the brioche.Ctrl and the brioche.EPS though this last sample contained less water. Indeed, 6% (w/w) of water was removed from the brioche.EPS recipe in order to keep the same consistency of paste during the manufacturing process. Thus, EPS acted as a hydrocolloid by conserving the water content of the product during the baking process. In the same way, it was impossible to found differences among the brioche samples in TPA parameters after one day of storage. But after three days, elasticity appeared to be the single discriminant parameter based on standard-error estimates (Table 3). The brioche.EPS were more elastic than the control. This instrumental measure of elasticity was correlated with the sensory analysis results. Indeed, after three days of storage, the two brioches (brioche.Ctrl and brioche.EPS) were judged significantly different (p<5%) by the panelists on textural criteria: the brioche.EPS product was softer than the control brioche. The relation between instrumental and sensory analyses has been well documented since the 1980s10. Besides, the TPA measurement has been standardized by the AACC and is frequently used to describe the textural characteristics of baked goods25-26. For different kinds of solid food, the hardness and the elasticity evaluated by sensory analysis are accurately predicted by the TPA analysis27. Softness is a major indicator in evaluating how a baking product behaves during ageing. Hydrocolloids are used in the bakery industry for their ability to bind water molecules. These molecular interactions affect the textural characteristics: softening the bread crumbs, increasing the loaf volume, lengthening the shelf-life and therefore delaying the onset of staling22, 24. Recently, dextran and inulin, two kinds of exopolysaccharides, have been used in the making of bread and bakery wares in order to replace fat or to improve the texture of the final products28-29. Similarly, the dairy.EPS obtained by the fermentation of a dairy product fermented by Leuconostoc EPS+, and then added as an ingredient, gave the brioche a softer textural characteristic than the control brioche after three days of storage. The decrease in the percentage of butter used in the brioche recipe seems to impair the overall quality of the final product during its storage. More specifically, the deterioration is more noticeable in the aromatic features whereas the textural characteristics seem to prevail. This observation has already been pointed out by other researchers working on another kind of product, namely cream-cheese30. Indeed, cream-cheese – characterized by a pronounced buttery aroma associated with the presence of diacetyl – was recognized by only 17% of consumers when it was de-structured31. A dairy fermented product containing bacterial EPS can be used as an ingredient in a low-fat brioche to help preserve sensory characteristics during at least the first three days of storage. It would seem that as regards consumer discernment of the sensory characteristics of a baked good – in our case, brioche – texture carries more weight than aroma. Additional experiments on other kinds of goods should be carried out to explore this hypothesis further. The authors would like to thank Carl HOLLAND for English revision. Caplice, E., Fitzgerald, G.F. Food fermentations: role of microorganisms in food production and preservation. Int. J. Food Microbiol., 1999; 50(1-2): 131-149. Gemelas, L., Degraeve, P., Hallier, A., Demarigny, Y. Fermented Dairy Product for a Low-Fat Bakery Product Application: Chemical and Sensory Analysis. Czech J. Food Sci., 2016; 34(6): 529-533. Dickinson, E. Hydrocolloids as emulsifiers and emulsion stabilizers. Food Hydrocoll., 2009; 23(6): 1473-1482. Verbeken, D., Dierckx, S., Dewettinck, K. Exudate gums: occurrence, production, and applications. Appl. Microbiol. Biotechnol., 2003; 63(1): 10-21. Hemme, D.: Leuconostoc and its use in dairy technology. In: Handbook of Animal-Based Fermented Food and Beverage Technology (Evranuz EÖ ed). Boca Raton: CRC Press, 2012; pp 73-108.
van Hijum, S.A.F.T., Kralj, S., Ozimek, L.K., Dijkhuizen, L., van Geel-Schutten, I.G.H. Structure-function relationships of glucansucrase and fructansucrase enzymes from lactic acid bacteria. Microbiol. Mol. Biol. Rev., 2006; 70(1): 157-176. Lacaze, G., Wick, M., Cappelle, S. Emerging fermentation technologies: development of novel sourdoughs. Food Microbiol., 2007; 24(2): 155-160.
de Roos, K.B. Understanding and controlling the behaviour of aroma compounds in thermally processed foods. Trends Food Sci. Technol., 2006; 17(5): 236-243. AACC, 2010. Method 10-05.01. Guidelines for Measurement of Volume by Rapeseed Displacement. In: International Approved Methods (ed). St Paul: Approved Methods Committee. Bourne, M.C. Texture profile analysis. Food Technol. 1978; 32: 62-66. Ponton, A., Grossiord, J.L. : Concept et outils de base en rhéologie. In: Grossiord J.L., (Ponton, A, ed). La mesure en Rhéologie: des avancées récentes aux perspectives. Les Ulis: EDP Sciences, 2014; pp 1-29. AFNOR. Sensory analysis – Methodology – The rankings range. NF ISO 8587, 2007; V09 – 018. AFNOR. Sensory analyses – Methodology – Triangular test. NF EN ISO 4120, 1995a; V09 – 013. AFNOR. Sensory analyses – Methodology – General guidelines for performing hedonic tests with consumers in a controlled space. NF, 1995b; V 09 – 500. Mironescu, M. Microbial polysaccharides production, characterisation and properties. Acta Univ. Cibiniensis. Series E: Food Technol., 2003; 7(2): 26–38. 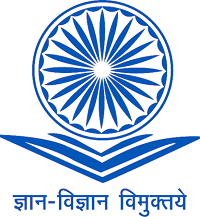 Purama, R.K., Goswami, P., Khan, A.T., Goyal, A. Structural analysis and properties of dextran produced by Leuconostoc mesenteroïdes NRRL B-640. Carbohydr. Polym., 2009; 76: 30-35. Tuinier, R., Zoon, P. Stuart, M.A.C., Fleer, G.J., de Kruif, C.G. Concentration and shear-rate dependence of the viscosity of an exocellular polysaccharide. Biopolymers, 1999; 50(6): 641-646. 18. Ruas-Madiedo, P., de los Reyes-Gavilán, C.G. Invited review: methods for the screening, isolation, and characterization of exopolysaccharides produced by lactic acid bacteria. J. Dairy Sci., 2005; 88(3): 843-856. Guichard, E. Interactions between flavor compounds and food ingredients and their influence on flavor perception. Food Rev. Int., 2002; 18(1): 49-70. Goubet, I., Le Quere, J.L., Voilley, A.J. Retention of Aroma Compounds by Carbohydrates: Influence of Their Physicochemical Characteristics and of Their Physical State. A Review. J. Agric. Food Chem., 1998; 46(5): 1981-1990. Le Thanh, M., Thibeaudeau, P., Thibaut, M.A., Voilley, A. Interactions between volatile and non-volatile compounds in the presence of water. Food Chem., 1992; 43(2): 129-135. Guarda, A., Rosell, C., Benedito, C., Galotto, M. Different hydrocolloids as bread improvers and antistaling agents. Food Hydrocoll., 2004; 18(2): 241-247. Oqali (Observatoire de la Qualité de l’Alimentation). Qualité nutritionnelle de l’offre alimentaire et reformulation des produits : bilans et évolutions. 2012. Paris. Gómez, M., Ronda, F., Caballero, P.A., Blanco, C.A., Rosell C.M. Functionality of different hydrocolloids on the quality and shelf-life of yellow layer cakes. Food Hydrocoll., 2007; 21(2): 167-173. Kusinska, E., Starek, A. Effect of fat content on the mechanical properties of texture of gingerbread pastry. Teka Komisji Motoryzacji i Energetyki Rolnictwa, 2012; 12(1): 121-125. Lynch, E.J., Dal Bello, F., Sheehan, E.M., Cashman, K.D., Arendt, E.K. Fundamental studies on the reduction of salt on dough and bread characteristics. Food Res. Int. 2009; 42(7): 885-891. Di Monaco, R., Cavella, S., Masi, P. Predicting sensory cohesiveness, hardness and springiness of solid foods from instrumental measurement. ‎J. Texture Stud., 2008; 39(2): 129-149. O’Brien, C., Mueller, A., Scannell, A.G., Arendt, E. Evaluation of the effects of fat replacers on the quality of wheat bread. J. Food Eng., 2003; 56(2-3): 265-267. 29 Vandamme, E.J., Renard, C.E.F.G., Arnaut, F.R.J., Vekemans, N.M.F., Tossut, P.P.A. Process for obtaining improved structure build-up of baked products. 2003. EP0790003. Wilkinson, C., Dijksterhuis, G., Minekus, M. From food structure to texture. Trends Food Sci Technol., 2000; 11(12): 442-450. Phadungath, C. Cream cheese products: a review. Songklanakarin J. Sci. Technol., 2005; 27(1): 191-199.